The Gigaset A490 is the basic telephone for your everyday calling needs. Enjoy relaxing calls with hands-free talking in brilliant sound quality. Comfortably dial the numbers of your friends and loved ones on the ergonomic keypad. With a standby time of 177 hours, the Gigaset A490 is ready-to-use when you need it. And its equipped with ECO DECT, which reduces the phones energy consumption and offers reduced radiation. Plus, with caller ID the callers number appears on the illuminated display so you know whos ringing before picking up. A basic phone with hands-free talking, the Gigaset A490 is a great calling solution. Simply select the hands-free mode on your Gigaset A490 handset and get even more out of your everyday calls. Gigaset technology gives you hands-free talking in brilliant sound quality. So you hear every detail even when youre busy working on the side. The ergonomic keypad, which is made of high-quality material, enhances your personal comfort when you call. Specially designed with you in mind, its illuminated to help you find the right number even in dim lighting. With the caller-ID2 feature, you see the callers number on the illuminated display before you pick up the phone. This way, you decide if you want to take a call or prefer to let it ring. A standby time of up to 177 hours ensures that the Gigaset A490 is charged and ready when you need it. And a talk time of up to 12 hours lets you savour leisurely chats without thinking about the battery. Brilliant hands-free talking, excellent usability and an attractive appearance: the Gigaset A490 gives you the best of basic telephony in a quality phone. It comes with a phonebook that stores up to 80 entries, an integrated alarm clock to keep you punctual, and an easy redial feature for the last 10 numbers. 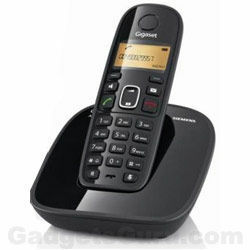 Want more Expand the Gigaset A490 by up to 4 handset. Featuring an energy-saving power supply, the Gigaset A490 uses less energy than our conventional cordless phones so it saves you money and is better for the environment. Like all Gigaset cordless phones, it also variably reduces transmitting power from the handset to base station according to their distance apart but goes further in a number of other ways. Choosing ECO Mode on this model allows you to manually reduce the base station?s transmitting power by up to 70%1 for all registered handsets. When docked3, this phone also reduces the transmitting power of both handset and base station to almost zero. As a result, you enjoy a more energy-efficient way of staying connected with the world.